Luminex is very delighted to present you the brand new 2.3.0 firmware for the entire GigaCore range. As you may know, the GigaCore switches already are the industry's standard in terms of simplicity, versatility and power when it comes to audio-visual networking solutions. With this new firmware, Luminex wants to push the standard even further. Thanks to the new set of feature, the GigaCore switches will help you to get a better control of your network infrastructure, a better manufacturer cross-compliance and a faster ROI. The front ports of the switches now support up to 30W per port (802.3 at compliant). Ideal to connect highly powered devices such as Dante network amplifiers or loudspeakers. The switches now support LLDP (Link Layer Discovery Protocol) for enhanced power allocation. ‍Reload Default: Once a profile has been defined as default, this one can be recalled through the reset button. This functionality is a must have for rental companies. ‍Factory Reset: The switch will be reset completely and all user data is being deleted. 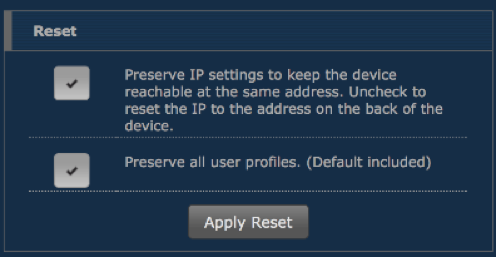 The web interface now displays the user specific levels of reset. The user can now define a default profile. This profile can easily be recalled through the reset button. Colours have been modified to match the GigaCore 26i groups LEDs colours. 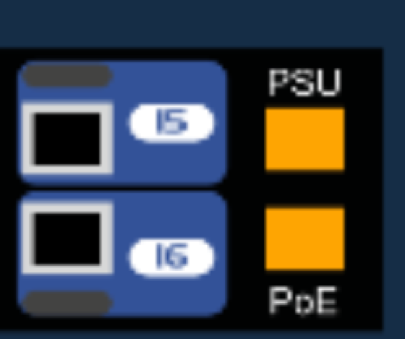 The PoE bar graph now indicates the allocated power of the powered device, according to its PoE class. The graph indicates the current power usage as well. The switch now starts sending 5 General Query messages at start-up, every 15 seconds and then send a General Query message every 125 seconds. New URLs are available to remotely manage the group’s port assignation. When the RPSU takes over, the available power from the RPSU is indicated in red in the PoE status page.